I know that I have had many computers over the years with all of the 3.5-inch drive bays filled with HDDs or SSDs, yet I wanted to put more storage into the system. You end up having to replace a small HDD or SSD with a larger one or just piling drives inside the case wherever they will fit. 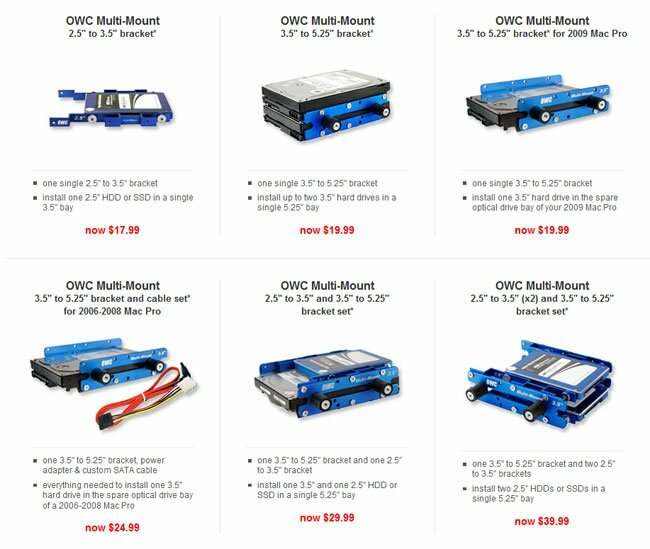 OWC has announced a new mounting bracket system called the Multi-Mount that comes in several varieties. All of them are made to let you mount storage drives in different places. Some of the brackets let you mount 2.5″ drives in a 3.5″ space. The most interesting of the line lets you mount up two 2.5″ SSDs or a single 3.5″ HDD in unused optical drive bays. I know I usually have several optical bays that aren’t being used. All of the brackets are made from aluminum and have open backs for cooling.